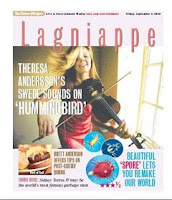 More great press on Theresa Andersson and her new CD Hummingbird, Go! including the cover story of today’s Lagniappe section of The Times Picayune and RollingStone.com. See you tonight (9/5/08) at Republic in New Orleans for her CD Release Party and unwind from Gustav evacuation party. And tomorrow (9/6/08), come see her at the Louisiana Music Factory at 4pm.